The pace of coastal erosion around north Norfolk might be a constant worry to property owners but the secrets exposed by the crumbling cliffs are about to be turned into what could become one of the county’s biggest tourism draws – the Deep History Coast. Roll back time to an age when East Anglia was connected to the continent by a bridge of land and early ancestors of modern-day man were roaming a landscape of grassland and woodland shared by such intimidating wildlife as sabre-tooth cats and mammoths twice the size of modern African bull elephants. A breathtaking picture of this unpredictable time is being pieced together by archaeologists as the soft cliffs give up more and more of their secrets along the fastest-receding coastline in Britain. The most dramatic finds to date – and ones that received international coverage – have been the almost complete skeleton of a Steppe Mammoth discovered at West Runton in 1990 and 850,000 year-old footprints of a wandering family group of ancient humans exposed by the pounding waves at Happisburgh two years ago. 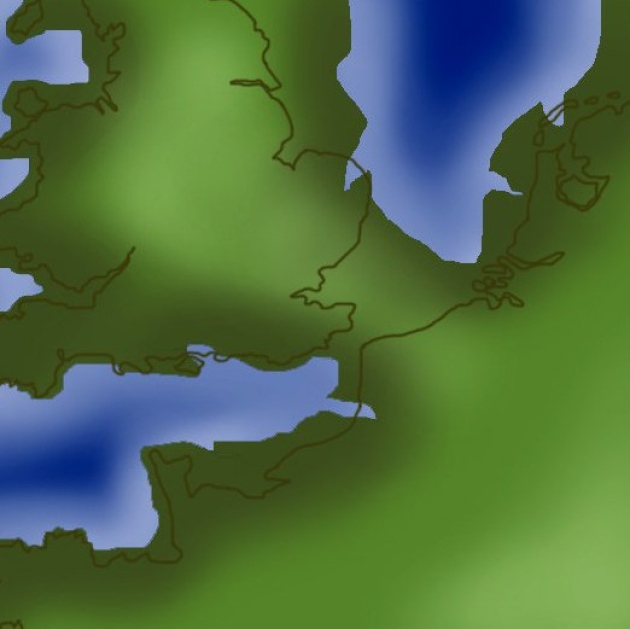 A map of Norfolk around 900,000 years ago. However, other smaller pieces in the scientific jigsaw – revealed as coastal erosion exposes new areas of what is known as the Cromer Forest-bed Formation – range from early flint hand axes to fossils of everything from sabre-tooth cats and rhinos to spotted hyaenas and even macaque monkeys. Now, as the picture becomes more complete of a pine forested land with a climate – but not much else – comparable to today, work has begun on developing a tourist attraction which it is hoped could become more important than the Jurassic Coast in Dorset and East Devon. Their aim is to display the mammoth as the centrepiece of a permanent Deep History Coast exhibition in Norwich Castle Museum within five years. Complementary displays will be put on in Cromer and Great Yarmouth’s Time and Tide museums. Meanwhile, within two to three years, it is planned to install interpretation panels, and possibly artwork, along the first Norfolk stretch of the England Coast Path from Weybourne to Sea Palling. The project will make use of the latest virtual reality technology in developing an app that will allow visitors to hold up their mobile device on the clifftop and see an image of the ancient landscape. Dr John Davies, chief curator at NMS, said: “The mammoth, which dates back 600,000 to 700,000 years, was discovered just at the time I arrived at Norfolk Museums Service. He said the story advanced a decade later when a flint hand axe was discovered at Happisburgh which, using the age of geological deposits to date it, proved that an early form of man known as Homo heidelbergensis had certainly been around in the area as long ago as 550,000 years. An even more significant advance came in 2013 when a research project at Happisburgh led by experts from the Natural History Museum and British Museum discovered smaller flint tools proving that an earlier form of human – Homo antecessor – had been in the area more than 850,000 years ago. However, the find that greatly magnified the potential of the Deep History Coast idea came in the same year when 850,000-year-old human footprints – the oldest found anywhere outside Africa – were discovered in sediment at Happisburgh that had been exposed by a storm. Dr Davies said: “The footprints were only there for two weeks but the reason they are so important is that they tell you about behaviour. While the museum experts have now finished their work at Happisburgh, research is being continued by local natural history enthusiasts, their finds being systematically recorded as part of the Cromer Forest-bed Fossil Project. 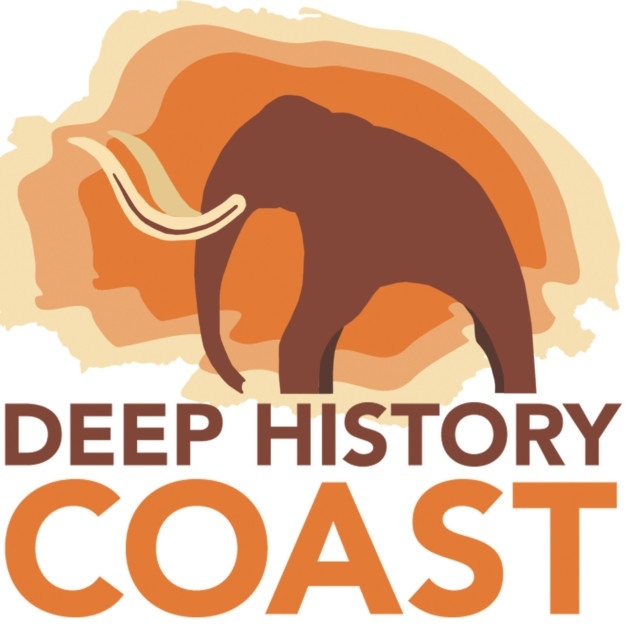 Amazed at how quickly the concept of the Deep History Coast – a name invented by British Museum colleague Jill Cook – had caught on, he said: “Things are going so fast now. “It looks like a real package with wonderful things on the coast and wonderful things in the museums. The story will initially be told in a ‘Humans in Ancient Britain’ exhibition, running from June 13 to September 6, at Great Yarmouth’s Time and Tide Museum. Dr David Waterhouse, NMS’s Curator of Natural History, said a few of the West Runton Mammoth bones are on show at Cromer Museum but the sheer size of the skeleton, largely in store at the Norfolk Collections Centre at Gressenhall, made displaying it problematic. Dr Waterhouse said they would be seeking a large grant for the permanent exhibition, which is likely to cost several hundred thousand pounds to put on. “I am confident it can be one of the most successful exhibitions ever staged at the Castle,” he said. 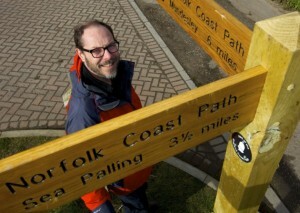 Norfolk County Council countryside manager Dr Andy Hutcheson said the first Norfolk section of the England Coast Path, which opened in December, offered the ideal way of exploring the Deep History Coast, offering wonderful views of the soft cliffs in places which had been difficult to access before. Dr Hutcheson said they had already identified a possible EU funding stream to develop the virtual reality app. He said: “The total amount of funding we need depends on the scale of what we do, but I believe the project deserves to be as spectacular as possible. He said his aim was to have elements of the project in place within two or three years. Pete Waters, brand manager at Visit Norfolk, said: “Deep History Coast will provide the county with an absolutely unique tourism proposition and is a fantastic opportunity to boost an otherwise under-developed part of the Norfolk coast. “Crucially, if done well and with good funding, it could encourage improved infrastructure and help grow year-round employment. There is no reason why this couldn’t be bigger than Jurassic Coast. “We can genuinely say that the first tourists to Britain came to Norfolk. “We can say that Norfolk is the cradle of British civilisation. Who would not want to walk in the footsteps of the first people to arrive on our shores? He said they had organised their first Deep History Coast press trip in February and the five national journalists on it had been convinced by the whole concept. “Take people to the top of the Sheringham Park watch tower and explain that as little as 7000 years ago the North Sea in front of them was actually land that resembled the African Serengeti and whose jaw wouldn’t drop,” he said.